Rizzrak, Goblin Shredder is a Sentinel Strength hero addded in DotA v6.73. 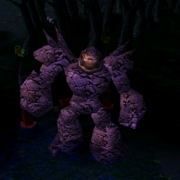 Goblin Shredder was the most awaited Warcraft 3 model which was yet to be included. Now it's here. Check Goblin Shredder overview and skill guide. Notes: Whirling Death deals magical damage by default. If it cuts down trees as well, it becomes pure damage. Notes: Chakram returns to you if you go more than 2000 units away. Destroys trees. WAW ! FIRST BLOOD ! IMBA ! was waiting for this hero for a long time.. dota 6.73 rocks !! When will be publish the 6.73ai? When will be publish the 6.72 AI ? What IS hiS sKILKL buiLD?? nice hero guyz... job will done..
but buy what item for this hero???? i hate it's 3rd skill. can Icefrog Blance him ?? this hero rocks..i can get beyond godlight only with lvl 4..
this hero should not in strength tavern but in intel tavern..cause in lvl 15 his live less than 1100..lower than other strength heroes..
i dont know if it is incorrect!